My sister Jessica and her husband Mark arrived in Licata on Saturday 27th February, in time to go out and have a bite to eat in the restaurant next door to their hotel (The Faro) near the marina. I had forgotten that Saturdays were Licatese nights out and the place was packed. We had a good dinner however – far too much as usual. The following day they came to inspect the boat (not much has changed) and we set off to visit the Villa Romana del Casale. This is a Roman villa which had been buried by a landslide, recently rediscovered and excavated and has the most amazing mosaics all over. They had been protected by the earth that had slid over them as had much of the outline and walls of the villa. It is suggested that it was owned by a major player in the Roman aristocracy, who would have been in the Senate or even part of the Imperial family. The only thing I could wonder about was the sheer “busyness” of the decorations – even in the family areas – I think it would have given me a headache! We took the “country” route back, stopping in a couple of hilltop towns and finding a small coffee shop which is a prize winning patisserie – world wide acclaim apparently! A number of church services were going on (it being Sunday) and all the townspeople were out in their Sunday best. 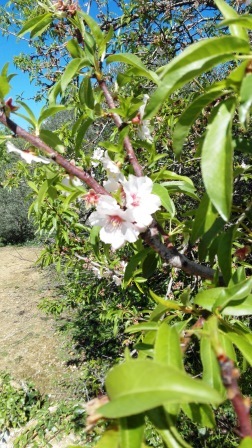 The hills were full of almond orchards now in bloom – almost at the end of their season. We took Dave and Annie Wood (Serenity) out to dinner at “La Duca” – the local fish and shellfish restaurant – so they could meet Jessica and Mark. Dave and Annie had stayed in our old family house in Broadstairs just before Christmas. A very pleasant day and evening altogether. 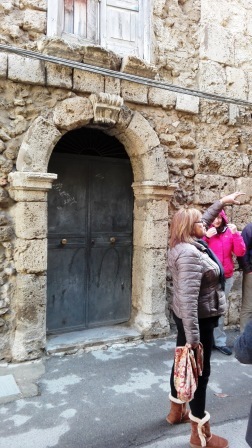 We were left to our own devices for the rest of the week as J&M went off to visit Syracuse and the Baroque towns. We did a bit of online shopping for parts for the new control panel Brian is planning to make and a new plug for the 12V transformer for the new HP computer. We had been working to get our SeaPro navigation software working on Windows 10. It is such a pain having to set it going, then it works for an hour or two and crashes – many blue screens went by although W10 gives you reassuring messages that it is searching for solutions! I emailed the Seapro help desk who gave me some good tips (as well as advising to download the most recent update for W10), and we did a bit of other web research. The most recent situation is that it does work without crashing quite so frequently (ran for about 72 hours continuously, but I think it rebooted itself a couple of times without us noticing), so long as the machine isn’t connected to the internet in any way! The other computer (Windows 7) had had that problem too – but it seemed to get better recently. So I guess the fallback computer isn’t going to get its free upgrade to W10 anytime soon. We also managed to fit in a trip to Lidl and the Chinese shop (lots of useful bits) and found the mobile gas parts van where we bought a length of tube to replace the existing gas pipe. It is supposed to be replaced quite frequently – the new one has a date stamped on it! Jessica and Mark returned at the weekend, pleading for normal food after being overfed in almost every place they had stayed! Brian’s sausage and belly pork casserole went down very well. I joined them in a visit to the Valley of the Temples near Agrigento. It was a lovely day out and the site is huge. Both Jessica and I needed mid-morning sustenance. The enormous temple of Zeus that is now in ruins must have been incredible with the huge 8m tall Telemon statues that lined the upper part of the temple. Much of the ruin had apparently been taken to build the port of Empedocle in the past. The remaining ruins of other temples were pretty impressive too – many partially rebuilt. The site was so big that they returned the next day to cover the parts we had not managed to visit and to go to the museum. Dave and Annie put on an excellent spread for all six of us on their boat that night – with bread & butter pudding to finish which was lovely – many years since we had enjoyed that! It was already time for Jessica and Mark to leave again, returning to Syracuse for the last night before flying back the the UK. It had been great to see them again. They had left just in time – at the end of that week (11th March) we were woken at 6am to an horrendous thunderstorm with pelting rain, hail and wind. We huddled under the duvet but sleep was not on the agenda for the rest of the morning. It all blew over by mid-morning but had lasted a good 3 hours. The following day I went with about 20 other yachts people on a historical tour of Licata organised by our friendly “professore”. 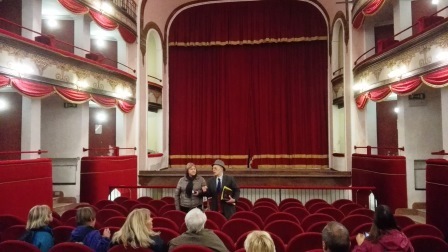 Unfortunately, church visits predominated – but we did get to see the Art Deco town hall and a triptych in the meeting room, the restored theatre and the outside of palazzos. Laura (the lady with whom we have occasional Italian conversation classes over a cup of coffee) valiantly translated but even she was overcome sometimes by the professor’s habit of stringing completely unrelated events together! Our booked date for the haul-out of 17th March was rapidly approaching. I had found an apartment advertised on Airbnb and we arranged to visit it. It was fine – all very clean and newly renovated – and ony 5 minutes’ walk from the yard where Alixora would be placed. There was no heating but we could take our fan heater which worked fine. 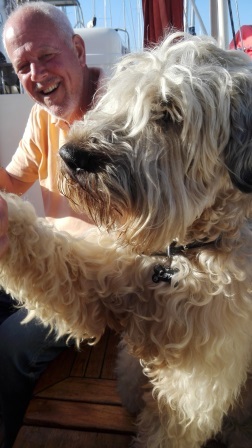 We collected the keys on the 14th having negotiated a cash deal and started moving stuff in, although staying on the boat until we took it round to the yard. 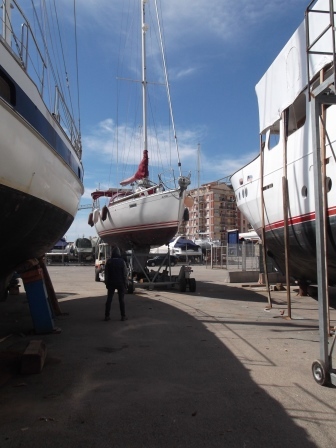 We had taken the genoa (front sail) off as that is usually mandated by the yards, and also packed up the dinghy (after Brian had scraped off some of the wildlife that had accumulated on the rudder and hull) and put them in storage in the marina offices. On Thursday morning we set sail (just about remembering how) and headed out of the marina, round the inner harbour breakwater and into the commercial harbour. We went straight into the lifting dock, the slings were put in place and Alixora was lifted out at about 10am. 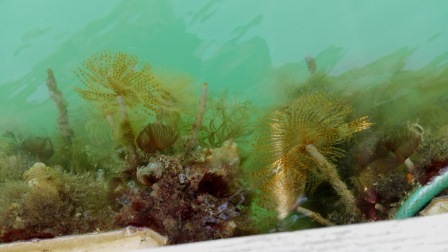 The bottom of the boat dripped with a good 6 inch forest of thick weed and slimy things. We left them to scrape and then power wash the bottom, then the boat was put onto a cradle (only 4 supports this year) and a clever system of a flat bed trailer lifted it all up and it was towed to our slot in the yard – where they just moved the walls aside to get us into the small space! We were hemmed in a bit by boats on either side which wasn’t very convenient. Also they would not allow us to use their scaffold towers for higher access. 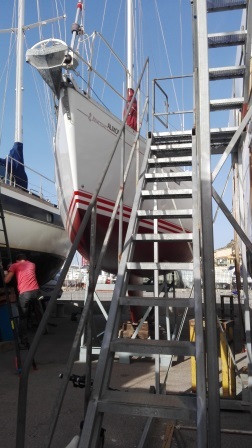 Never mind – Matt, the Australian lad who is building a yacht maintenance business here in Licata, would be doing the topsides polishing for us this year and was permitted to use the scaffolds! We found some big cable drums for our own access and a trestle. Matt also did some good work chipping away a lot of the flaking old antifoul (worst it has ever looked), which I followed up with on the angle grinder (poor boat). 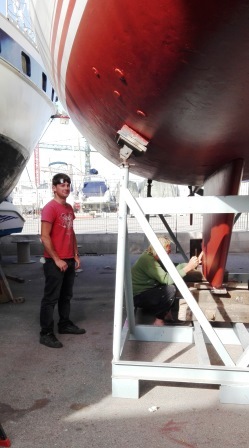 Brian and Matt stripped the keel right back to the metal all over this year – much better but hard work. The boat was lifted a lot higher than we had previously experienced so we decided to take the rudder off and see if we could get a new bearing to stop its slight wobble. Also when we looked at the propeller the bearing that holds the shaft in place where it enters the boat was ruined and needed replacing. It is called a cutlass bearing for some strange reason. 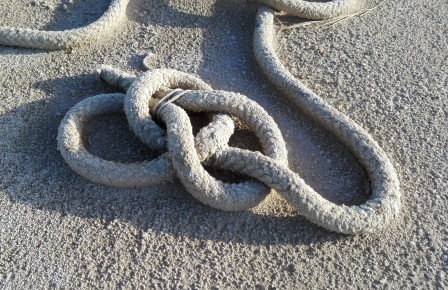 Now we know what the strange noise was when we had tangled with mooring lines last October. Of course getting the propeller off and the shaft out was a major job. It also left a nice sharp edge on the tube that holds the bearing and shaft that Brian managed to bump into and get a big cut on his head! Without going into a lot of detail, the next two weeks were full of sanding, scraping, epoxying, repairing, polishing etc. I also had to move all the stuff out of the cabin where I keep my clothes so I could clean down the headlining (yes that again) and stick it back up. That took about 3 days altogether. We lost a couple of days due to rain (massive thunderstorm again at 4am one night), but apart from that the weather was fine if a bit windy at times. Certainly not as cold as it had been last year. I had taped up the pretty red and white stripes at the water line to repaint them, having found both red and white enamel paint in the chandlery. First I painted the red stripes (Brian helped with that), and waited a day for it to dry – it looked great. Then I taped the red and painted the white. When I took the tape off after that it took big chunks of the new red paint with it! Oh No – I was not happy. So another two days were spent resanding the patches and then repainting them being careful to take the tape off quickly so the same didn’t happen to the new white stripes! It doesn’t really show unless you look closely. As so much of the hull was down to gelcoat, we decided to prime the whole thing with epoxy two-part primer. 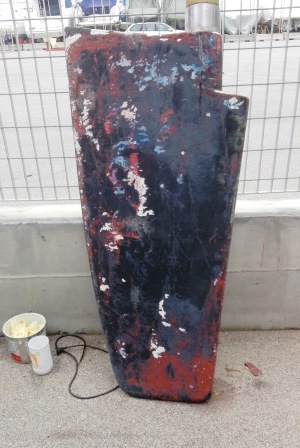 As we applied it more of the old antifoul that had not been loose before came off on the roller! Another disaster. 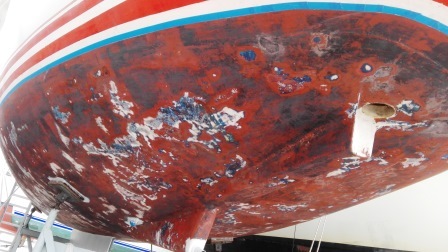 It was impossible to prevent, so the bottom of the boat is now covered in little flakes of antifoul embedded in the primer! 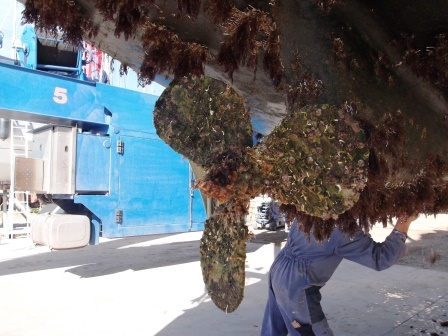 Then we covered it all up with 3 layers of thick antifoul – but they still show through. 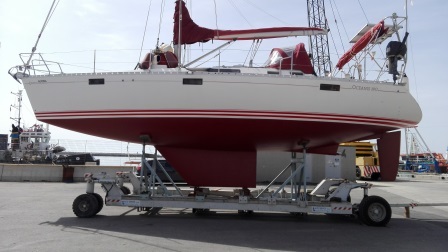 Brian had cleaned and polished the keel – it looked great when it was primed. 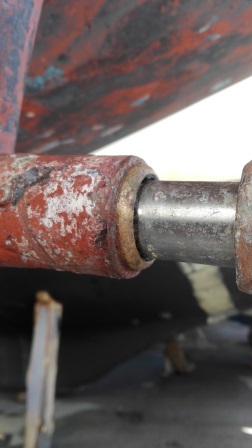 Then two days after we had put the antifoul on, a blister about 3 inches in diameter appeared! In the same place as the one that had erupted last year. Oh No yet again. So it has just been scraped back and old silver primer and new antifoul slapped on it. We had discussed a new layout for our toilet piping, having bought a new 3 way valve for the holding tank outlet. Brian took out the existing pipework and temporarily re-routed the old pipe direct to the sea outlet – the rest of the work remains to be done! Even that took a while as the pipe is very stiff and difficult to get to bend around the corners. hed it in, measured it and cut it – pushed it in again and it went in further – oops. That was before Easter – when everything closed down for four days! Eventually he got another one (much stress not knowing if he could find the same size again) and this time measured it correctly. Brian and he took a good half day getting it pushed into the fitting – it has to be a very tight fit to prevent it spinning around the prop shaft! Once that was done we were able to reinstall the prop shaft and propeller. Both Brian and Matt spent some time trying to align the shaft with the engine but it has remained somewhat out of true. Matt is bringing another engineer along in the next day or two to have another go to get it aligned – not an easy job in a small confined space and with a very heavy engine to try to move around. 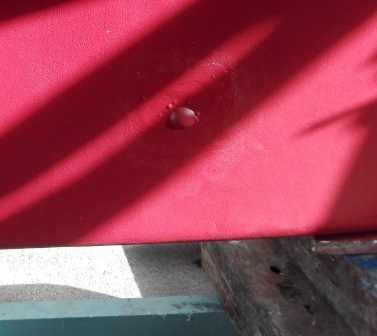 He had sourced some material to make a new bearing for the rudder – it was a bit too thick so both he and Brian sanded it down – only to find that they had jointly sanded a bit too much off! Another failure but it is in now and the rudder still wobbles a bit! As I mentioned, Easter happened in the middle of all this. 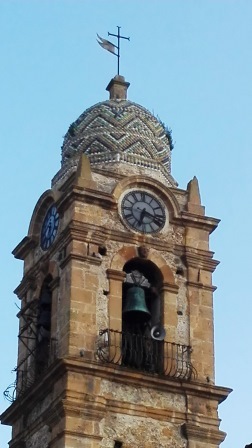 We carried on working but heard the bands playing as the processions wound round the old streets of Licata, and the long sermons and bells ringing. I have borrowed some pictures from friends who went to see the processions. From our balcony I did see one bier being carried off, surrounded by over 100 men dressed in dinner suits, but covered with white coats belted at the waist and with large white head coverings like the nurses used to wear in the past. The procession then included the band and was followed by hundreds of people. One night I was asleep and got a sudden awakening at midnight as a brass band started to play a dirge very loudly at the end of our alleyway! One of the churches on the procession route was about 50 metres away from us. Finally we were finished and Alixora was looking quite smart if you didn’t look too closely. 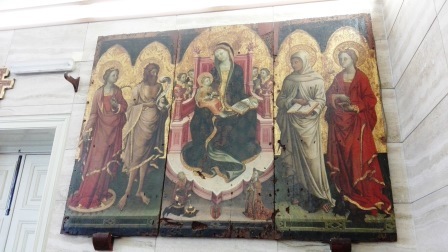 Matt had managed to polish the sides and most of the back, including filling in some holes he had discovered under cosmetic treatment that we had never previously removed. It remains for me to polish the deck! We had also sourced some Velox special bronze propeller primer and antifoul that had been recommended and that we had never been able to find before. We will see how that works as the stuff we put on in Monastir last year didn’t have much effect. We stayed in the apartment for a couple of days after we took the boat back to the marina, slowly transferring all the stuff that had accumulated back to the boat. I managed to sweep and clean the dirt that had accumulated inside the saloon and cabins – the yard was very dirty – as well as rinse off the decks of the grit and sand. 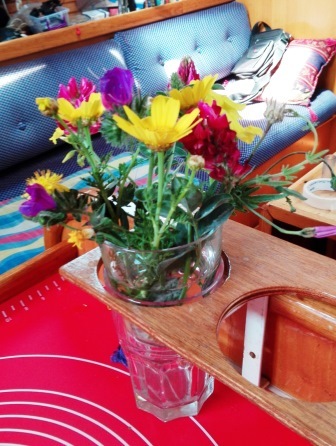 Somewhere in there I managed to fit in a birthday – Brian found some pretty wild flowers for me! It was great having Matt’s assistance for all the work we had to do – we would have taken far longer ourselves if he had not been around. While we were in the yard, our friends on Skylark II were scheduled for their haul out with the neighbouring company. 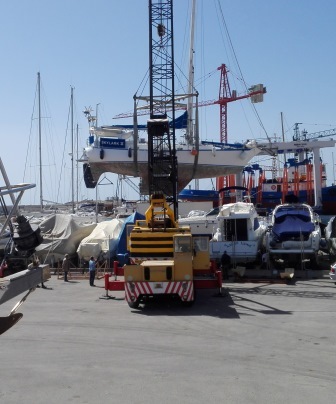 They had a crane instead of a travel lift and in an effort to squeeze the boat into too small a space it was hoisted high in the air. Desi and Chris were petrified! Also while we were working, three men arrived to start work on another boat that was in the yard. It had been blown off its stand in a small tornado that had hit in early October and had a huge hole in one side, the strengthening ribs inside had been damaged too, and it had bent one of the engine brackets. Our trials and tribulations seemed minor in comparison. Matt is also trying to fix our engine water pump(s). The new one we installed a while ago has a small leak. He has the old one (also with a leak) to fix first but is having difficulty sourcing the correct seals. I guess that is one of the key things we need to have done before we can leave, but Matt is now in great demand for everyone’s spring jobs. Brian’s Dremel stopped working. Amazingly Dremel have a 2 year guarantee, I had to search previous blogs to find out when we had bought it! This was June 2014 in Kalamata, Greece so I could easily find the receipt. 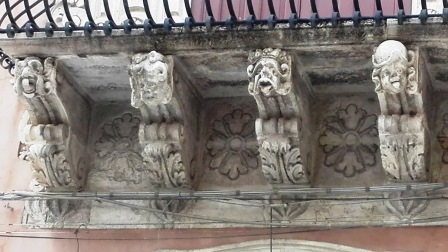 It is now with the Dremel repair shop in Palermo being fixed – the date for return not yet advised – another item we have to wait for! The final thing to break (so far) was the depth meter. It had been working most of the time we were in the yard, then finally gave up the ghost. It is only 2 years since we installed the last one, but the guarantee is only for 12 months, so an order for a new one of those, and a new speed log which we also found defective was sent off to one of the UK online chandleries. Since we have been back in the marina many other boats have taken the trip round to the yard for their annual bottom clean. 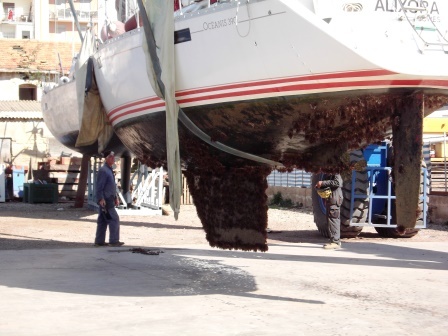 Some get away with just a 3 day wash and repaint – others have bigger problems! Once we were back on the boat and had sorted ourselves out (including having a good rest) I started work on the rest of the list of jobs that had accumulated. The weather was improving enormously so it was a pleasure to be able to work outside although we did have another couple of days of heavy rain, laced with lots of Sahara red sand. I have since made new covers for our fender steps to match the others, much smarter than having them covered in old T shirts! Also the “best” gangplank has been sanded (again courtesy of Matt and his machine) and varnished and non-slip strip applied. 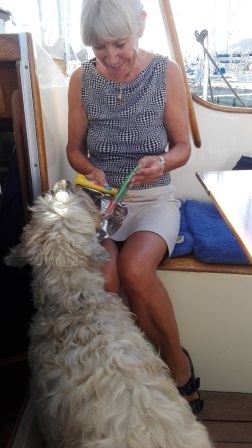 About a week after we got back on the boat, Brian fell ill with what he thought was salmonella poisoning – severe stomach cramps mostly which are taking a long time to go away. Perhaps it is something else. He is still in recovery mode and feeling pretty weak, and of course cannot get on with the jobs he wanted to complete. However we are not in any great rush to leave and we are enjoying a minor heatwave here. While we were in the apartment, the swifts started to return on their spring migration. Huge flocks screamed around the rooftops – lovely to watch. Also we have just seen a few swallows, and also a small flock of bee-eaters flew past the marina the other day. Summer is definitely on its way. Not only birds migrate but also people. The summer cruisers are arriving back in force – many having been away since October. We had a surprise visit from our Norwegian friends Eva and Erik. 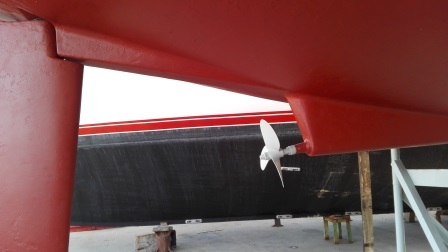 Their boat Nocturne has been on shore in Porto Palo for a year, being treated for osmosis (a failure of the gel coat allowing water to get into the underlying fibreglass). The boat is now ready to be launched. We went to the marina café and met up with Norwegians here – Morton and Anne-Inger. Both couples have the same type of dog, but Eva and Erik’s (Arja) didn’t want anything to do with the other (Loeve)! I sat on one end of the bench holding one dog and eating a sandwich while the four Norwegians revelled in being able to “talk without thinking” as Erik described it. Eva found out that she knew one of Anne-Inger’s cousins very well! And this week it was Loeve’s 12th birthday! 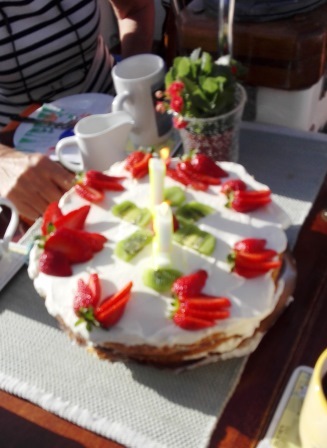 Syd, Birgit and I went along to his birthday party – Asti Spumanti and a big cream cake! I bought some doggy treats for him as he wasn’t allowed the booze or cake. They were most appreciated. Hopefully I will publish another update before we set sail or soon after. Our first destination will be Corfu, Greece with a few stops in between.